Reactive against all variants of Aequorea victoria GFP such as S65T-GFP, RS-GFP, YFP and EGFP. Protein A will not bind goat IgG, so use alternates (eg. 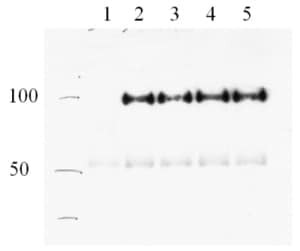 protein G) in IP with this antibody. 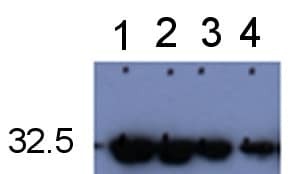 This antibody is available in an affinity purified form as ab5450. Our Abpromise guarantee covers the use of ab5449 in the following tested applications. IP Use 0.5µl for 106 cells. KIR-EGFP IP's with Goat polyclonal to GFP (ab5449) using 0.1 ul for 2x106 cells. KIR-EGFP detected with a mouse monoclonal to KIR receptor (Borszcz et al EGI 2003, 33: 1084). Lane 1 : parental YTS cells (negative control) Lanes 2-5 : YTS cells transfected with KIR-EGFP (mw 88 kD) KIR-EGFP IP's with Goat polyclonal to GFP (ab5449) using 0.1 ul for 2x106 cells. KIR-EGFP detected with a mouse monoclonal to KIR receptor (Borszcz et al EGI 2003, 33: 1084). Publishing research using ab5449? Please let us know so that we can cite the reference in this datasheet.